» EV charging stations downtown? How about a charging station here, at the drive-up of the city-owned former Wells Fargo branch downtown? Should the Central Albany Revitalization Area provide charging stations for electric cars downtown? The CARA advisory board will get a chance to talk about that idea when it meets on Wednesday afternoon. One of the likely issues, besides the cost and whether this is a proper project for the urban renewal district, is where one or more charging stations could be installed. Each one presumably would take away a regular parking space. 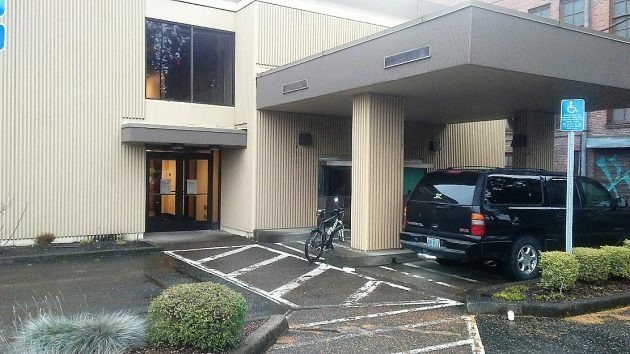 Riding around on the bike the other day, I thought that maybe the drive-through at the former Wells Fargo branch at First and Broadalbin would be a possible spot. CARA recently bought the vacant branch for $1.5 million, hoping to turn it into a draw for downtown. The cost of providing charging stations, including infrastructure, equipment and installation, runs up to about $12,000 per port, according to the memo. Prompted by one of the comments below, I looked and yes, you can charge electric cars at the Albany Walmart. In fact, there are four charging stations there. Are there not some at Wal-Mart also? Or am I mistaken? The Green New Deal requires the elimination of all fossil-fuel use by 2030. And a government “emergency” order that forces everyone to buy an electric vehicle will happen after eWarren is president. So, CARA, it’s time to amp up this “investment” and install as many free charging stations downtown as possible. What’s that…..the electricity won’t be free? – stay at the CARA subsidized boutique hotel downtown so I can feel like a rich person. Gordon you need to run for Mayor. I’d vote for you. I have never seen a charging station being used. Hasso, how many electric vehicles are registered with Albany addresses ? In Linn County ? We use the charger at Fred Meyer for our EV when it’s available. Unfortunately, most of the time a standard vehicle is parked in that spot so we can’t use it. I’m hoping CARA addresses the long tailpipe problem in Oregon because about half of Oregon’s electricity is generated from coal and natural gas. Another 40% comes from hydro, and the number of dams is shrinking because they aren’t green enough. CARA is thinking about this dilemma….right? When is the last time you have ever seen one being used? I expect that CARA or city council will install several downtown robbing of needed parking spaces. Not a dollar of taxpayer’s money should be spent on any of these until an equal number are provided with an attendant to provide free gas to conventional cars. Waste of a good parking spot…just like all the rest of the so-called charging stations. So, CARA wants to install Level 2 chargers? These are 240V 40 Amp AC plugs. It takes 4-6 hours to charge your vehicle’s battery. And the chargers cost about $5,000 each. Not sure where CARA got their $12,000 number, but hey, this is government so there’s probably a 140% markup for bureaucratic overhead. If CARA wants to go big time, they should install Level 3 480V DC plugs. These will get your vehicle’s battery to 80% in 30 minutes. They cost about $126,000 each. Of course, chargers are only useful if they get used. CARA will measure actual usage and revenue, right? This info will be publicly available, right? I believe there are two stations at Walgreens on Pacific. I have never seen a car using them but then I am not there 24-7. It seems like a good thing to have for those people that cannot charge at home and live downtown. Apparently there’s enough city employees driving EV’s for CARA to “invest” in some more back scratching to keep them in existence? Poor people can’t afford to purchase these vehicles yet they have money extorted out of their electric bill so those that can afford such vehicles get free “fuel”. Electric vehicles aren’t only for the wealthy. We pay $186/month for ours. Walgreens had one for a few years, then removed it. I don’t know of any others in town. Don’t they charge people to use them now? I know Telsas were free for awhile, but now they’re charging for use and I think other companies are doing the same. Not sure where you all are getting the idea that these charging stations are ‘free’, folks have to pay to charge their vehicle. What about the “free” money farmers get in crop subsidies. What about “free” monies granted business under the guise of business dedUctions. What about the richest Americans who only have to pay FICA up to 90K or so. They still get their “free” social security. There are, of course, thousands of additional examples. The point being, if you “feel” your oxen is being gored, then you will howl like banshees. But, if not, you are as meek as lambs. The hypocrisy would be stunning if it weren’t so disgusting. Gordon, you are right on. Where is all this electricity coming from? Got to take the dams out. Oh, wind. It only takes something like 260 tons of steel to make a wind machine, plus several tons of coal plus somehow they have to be mounted after they are transported to the site. They are really efficient as long as they are subsidized. I have never seen the one in front of Fred Meyer being used. I suppose the one was mandated by the City. Despite the whinging from the Albany Reactionary Collective Association [ARCA], the day when all parking places in downtown Albany will feature some sort of recharging capability is not far off. It is difficult to understand what all the Negative Nabobs are so concerned with. Nothing in these comments had anything to do with the invention of or the evolution of the gasoline engine. Reading these shallow comments, one could easily think these folks were working side by side with Henry Ford to make certain fossil fuel vehicles would be the only mode acceptable for all time. Nobody making these baseless claims has ever seen any fueling station give away their gasoline, yet somehow, these same folks believe that “free” electricity is going to cause their personal financial circumstances to take a hit, again, even though no one has ever said electricity was free. Bottom line. The Whingers whinging on this topic have NO clue as to what they are claiming. They have zero insight into how the future will develop. They have no sense that over time, things change. They believe that simply because they exist that technological advancement has peaked on their watch. If these same Whingers were to look forward, rather than in their usual rear view, they might actually discover that the world does NOT, repeat, does NOT revolve around their stagnant thinking….in fact, quite the opposite. The planet and the people on it are in constant flux. Pretending that it isn’t so does not change reality. Build car-charging stations at every meter. Hasso, I applaud you for trying to decipher this senseless word salad. 250 words of gibberish and a final sentence that defies logic. It’s like looking at a messy tattoo. Electric car purchases are subsidized by tax payers, so why can’t electric car owners subsidize their own charging stations. If charging stations were such a good deal, investors would be fighting to own them. Do all these complaining people get their electricity at home for free? One doubts it. Why then do these same foolish folks leap to the conclusion that electrical charging stations are going to give electricity away for free. The Green New Deal isn’t law. These Wendy Whiners must have little else to do. I tried to hang back, but this is too much, I drove a Nissan Leaf for 3 years, so I know. Very little free charging available, The first year of roll-out it was free, but that was to entice people in. You need apps or membership cards to charge at virtually all stations. You pay the rate that the vendors charge. they probably don’t get that much use, There may be some free parking at some locations, where the owners may use it as a come-on to shop there, but EXTREMELY rare. You may get the ability to charge using 110V household plugs for free, but it’s so slow you start thinking about putting a power drill to your skull to pass the 18 hours it would take to get a charge. Nobody uses 110 unless they have no other choice. Tempest in a teapot because all the people that have spouted these opinion have no idea what they’re talking about. When you have a current EV you can go 150 to 200+ miles on a charge. When I had my LEAF with an 80 mile range, I had to charge it when I went to Portland ( and I had to pay) to make sure I could get home. Those days are over. These days everybody charges at home. If you want to take a trip you stop at fast chargers for an hour, and pay for the juice, an go another 200 miles. Make no mistake, EV’s are selling and they will sell more and more. They are vastly cheaper to operate. World wide, in 2012 there were 190,000 EV’s, today there are over 5.4 million. One other thing: Your kids aren’t as afraid of change as you are. Finally, an informed voice with experience. Other than that, enough narrative wind to overcome that historical resource. Having said that, before I retired, I tracked the market for a small generator. More than once, wind pushed us into negative income territory because it exceeded hydro generation for the BPA grid and left us no headroom. If you think too much CO2 causes problems–wait till all the batteries and solar panels hit the trash heap. Massive disposal contamination costs. One again, you are a stone, cold liar. Let’s quit misusing words like “liar.” Being wrong in one’s assumptions or opinions, if such be the case, is far different from lying. Hasso, thanks for rebuking Woods. When Bill Clinton stated, “I did not have sexual relations with that woman (pause, eyes averted), Ms. Lewinsky”, we couldn’t honestly accuse him of lying because we didn’t have adequate evidence to support our suspicion. His falsehood, intention to deceive, and immorality became repulsively clear after the stained blue dress was made known. Clinton clearly lied to us. In the future I hope Woods follows my lead and applies the Clinton Standard before claiming someone is lying. The “Long Tailpipe” discussion isn’t as simple as many think. Gas cars use as much electricity as electric cars. Oil refineries sometimes have their own power plants that can power a small city. It takes about 6-8kWh of electricity to make a gallon of gas, the same amount to charge an EV to go about the same distance. Electric cars aren’t perfect, but they are better than gas cars in many ways and an overall improvement when taking everything into consideration. There are no oil refineries in Oregon so in effect gas cars have a long tailpipe that pushes pollution as well as profits to other states (and other countries that we buy oil from) whereas at least electric cars use local electricity which boosts the local economy. It also helps reduce our dependency on oil and the long history of unrest around the world as a result. If we step back and look at the historical U.S. grid mix, it is getting cleaner every year so EV’s get cleaner with age whereas gas cars get dirtier. Also, many EV owners have solar which offsets their electricity use.